During the workweek, we may spend more time with our colleagues than we do our families. That’s a lot of time! Why not enjoy it? We know that our work life is a direct contributor to our overall happiness. What we might not realize is just how important our relationships are at work. Not just professional relationships but real, meaningful relationships built on support and trust. Whether you have a best friend at work or just strong bonds with your colleagues, it matters. The World Happiness Report 2017 found that the level of support that a worker receives from his or her co-workers is a very strong predictor of all four measures of subjective well being utilized in the study: life satisfaction, job satisfaction, happiness and positive affect. Those who indicated that they had a best friend at work were seven times more engaged in their jobs compared to those who don’t. Maybe you tense up on the thought of getting too close to colleagues. You may worry that it could interfere with your objectivity to handle conflict. Or that it may just plain make things messy. You’re certainly not alone. While this is a valid concern and one that should be treaded carefully, building connection at work reaps many benefits and is worth any challenges that may arise. 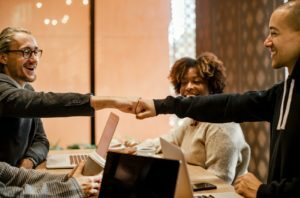 While some work friendships happen organically, being intentional about connecting with your coworkers will help to build positive relationships in your workplace. Ultimately, what will follow is a renewed sense of comradery, teamwork and collaboration. Conversation is valuable. Think about how nice it is to walk away from a good chat with a colleague. You might walk away with a pep in your step, ready to tackle your next work task. You might even feel more connected to your company because you feel heard and valued. Ask others how they are doing, what they did over the weekend or how their family is. And truly listen to the response! Continue the conversation rather than rushing off to the next task. Share your own stories or happy news about your family. Others will feel included in your world and they’ll want to share too. Ask your colleagues or direct reports what their latest challenges have been in their work and how you can support them. Share your own personal setbacks, successes and how you manage your workload. Allowing yourself to be vulnerable will allow others to open up too. Acknowledge your own challenges or weaknesses. Ask others for help, maybe on a technical task like setting up an Excel spreadsheet or for their advice on a difficult situation. If others observe you asking for help, they will be more willing to ask you for support. Positive work cultures lead to better productivity. Take time for the people you see day in and day out. Connecting with others in meaningful ways will help build a workplace culture of respect, trust and support. And maybe, you’ll even make a friend out of it! A career coach can help you learn how to better connect with your colleagues and build a positive culture of support. Check out our executive coaching services and sign up for a free consultation here.